#Evol2012: Inversions and spruces and tethered snails « Nothing in Biology Makes Sense! Mohamed Noor described the importance of chromosomal inversions—literally, chunks of DNA code that have been flipped end-to-end within the chromosome—in reproductive isolation between two species of Drosophila fruit flies. Inversions have the interesting effect of preventing recombination from breaking up groups of genes within the inversion; but some recombination is still possible, if very rare, and it should create predictable patterns of genetic divergence across the inverted region. Most of the major phenotypic differences between Drosophila pseudoobscura and D. persimilis map to three regions that are inverted in one species relative to the other—Noor presented work from his lab that finds very fine-scale differences in genetic differentiation across the inversions, consistent with predicted variation in recombination. In a much-retweeted line, Noor pointed out that it’s possible to think of species as “groups of alleles in long-term association.” Chromosomal inversions being one way to help maintain those associations, plainly. Sally Aitken showed off some nifty work on the adaptation of Sitka spruce populations to clinal variation in climate. 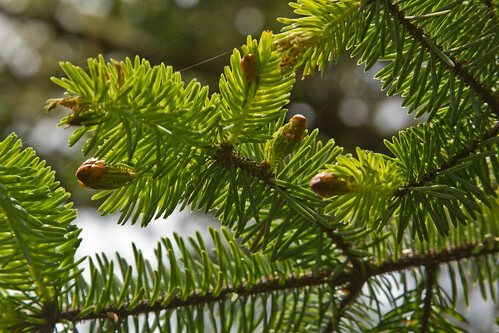 Spruce are, of course, too long-lived for easy experimental measurement of selection, so her lab has used an approach comparing clines in genetic marker frequencies in adult trees, which have presumably survived local climate conditions, to clines at the same markers in seedlings, which include seeds transported from different climate conditions—beccause adults show steeper clines than seedlings, it looks as though that seedling dispersal is offset by selection occurring between the seedling and adult life-stage. Jeff Conner examined the evolutionary changes that made wild radishes into a major agricultural weed. Among these are seeds that are similar in shape and size to wheat seeds, and so hard to separate out from the crop; less investment in leaf growth and more rapid maturation to seed production, to better ensure reproduction before pesticides or other weed management methods attack. Elizabeth Boulding showed how dispersal distance can shape the response of a prey population to invading predators, comparing local adaptation in predator resistance by species of tidal snails with and without a larval developmental stage that can widely disperse in a “planktonic” form. Testing predator resistance in these snails was straightforward, but kind of hilarious: Boudling and her collaborators used string and epoxy to tether snails outside shelters used by a predatory crab, and then tracked whether or not the crabs successfully broke through the snails’ shells after a set period of time. This entry was posted in conference, conservation, Evolution2012, invasive species and tagged ecological cline, predator-prey interactions.